Chitol, also known as the Featherback fish, is a native fish of the Southeast Asian region. Its flesh is tender as butter but its body is full of bones, so people usually use it for fish dumplings, cakes, sauces or any dish where the meat is not served whole or in fillets. We found packets of Chitol fish meat at our local Asian store and decided to make the authentic Bengali dish of Fish Dumpling Curry. Dumplings are defined as “cooked balls of dough” and these fish dumplings are based on potatoes. It’s cooked in a spicy gravy and usually served with white rice. Boil the potatoes and mash those with fish paste and spices. Make fish balls and fry the balls. 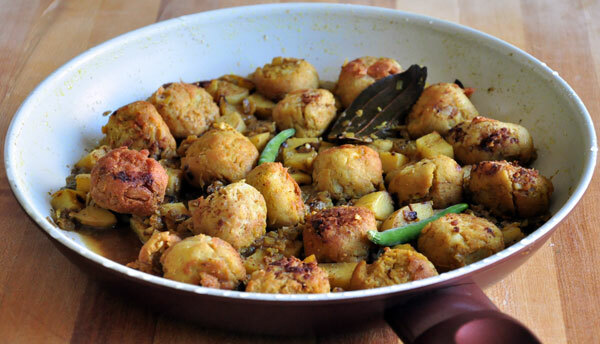 Cook the remaining potato with spices and fish balls. First boil 4 potatoes and then smash the potatoes. Add the fish paste, ginger paste, onion paste, garlic paste, red chili powder, turmeric powder and salt. Then mash those all together. Using some oil in the palm, so that the mashed paste don’t stick to the palm, make fish balls. Start boiling some water in a large bowel and when the water starts boiling, add the fish balls. Initially the fish balls would sink, but after some time those will start to float. Turn off the heat and skim out the floating fish balls with a spatula and place it on a plate with a paper towel. Keep the fish balls aside. Heat oil in a pan. 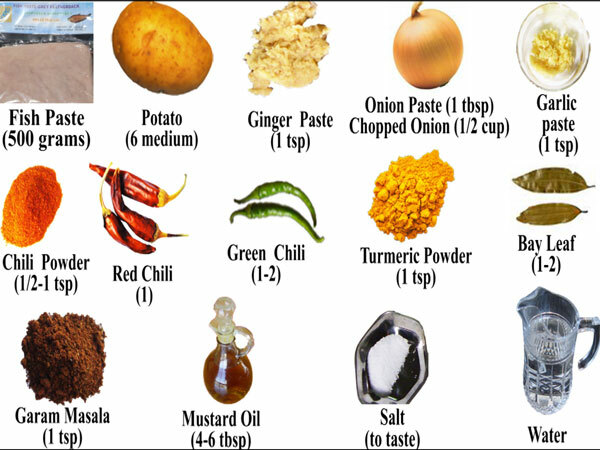 Normally mustard oil is used. But you can use vegetable oil as well for the deep frying. When the oil is hot, add the fish balls and start frying. Turn over when one side turns brown. Continue frying till all sides turn uniformly brown. Then remove those and put on a plate with paper towel to absorb the excess oil. Set those aside. Heat a fresh pan, When it is hot add the oil and then add the dry red chili, a bay leaf. Add the chopped onion and stir for a minute or two. Continue stirring till the potatoes turn slightly brown. Add ginger paste, garlic paste and mix. Add the cumin powder and turmeric powder. Then add water and mix. Then add salt and stir. When the curry starts boiling remove the cover and add the fish balls. Mix and continue heating for another 2 – 3 minutes. Cover and heat for a minute. Remove the cover and turn off the heat. This completes the Chitol Muitya. Serve the muithya with hot rice.